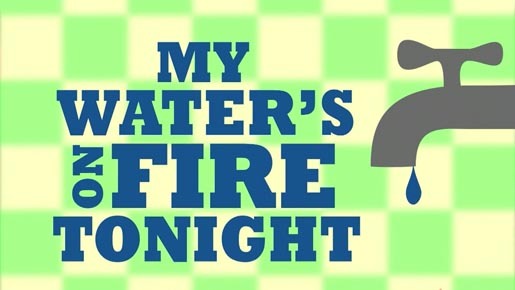 TIME Magazine has named “My Water’s On Fire Tonight (The Fracking Song) as the number two most creative video of 2011. The environmentally-charged video uses tackles the subject of hydraulic fracking, the injection of fluid into the ground to ease the way for extraction of oil or gas. Using motion graphics the Fracking Song video explains the concerns raised by ProPublica’s expose of fracking-related water contamination. Adam Sakellarides and Lisa Rucker, a graphic designer and editor at Pictures in a Row, decided to help out their friend, a graduate student in NYU’s Studio 20, with a project explaining fracking, a controversial new natural gas drilling technique said to contaminate drinking water and air. Driven by their friends’ catchy lyrics, the two used animation, type and visual cues to break down the highly complex environmental issue and create a Schoolhouse Rock-like video for the modern age. The project came together in less than 2.5 weeks of nights and weekends perfecting the fun and catchy video. Music is by David Holmes and Andrew Bean. Lyrics and vocals are by David Holmes and Niel Bekker. Animation and design are by graphic designer Adam Sakellarides and editor Lisa Rucker.